Painting progress has been slow for a while but I just managed to finish another Blood Axe Nob for the warlord’s retinue. 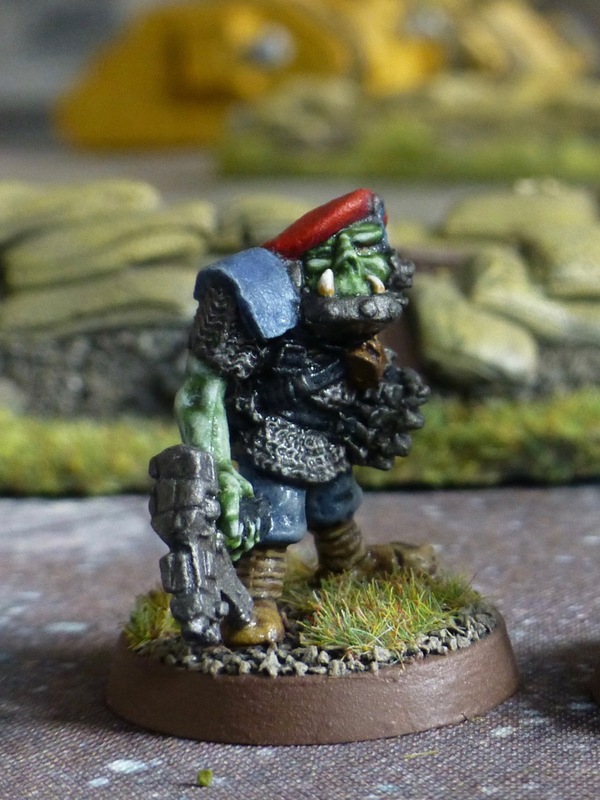 The sculpt is of Thrugg Bullneck himself, leader of the infamous Space Ork Raiders created by Kev Adams. Note the rock formations and alien plant life in the background, which were bought from a pet store aquarium section. 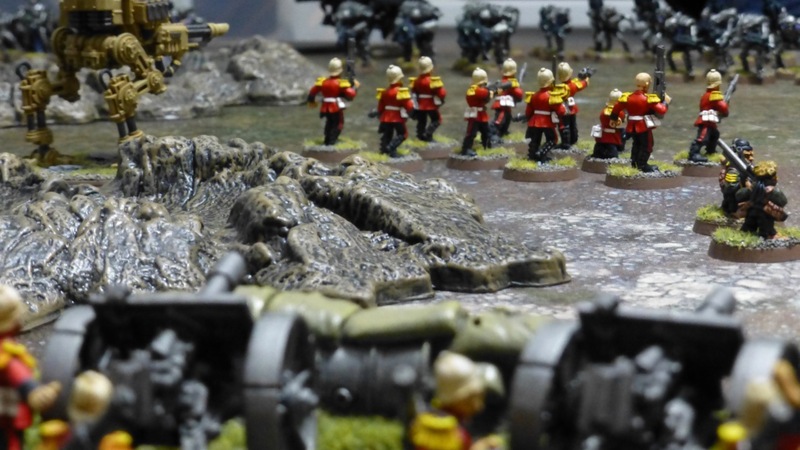 Buying ready made wargames terrain while watching dogs getting shampooed? A win win situation. 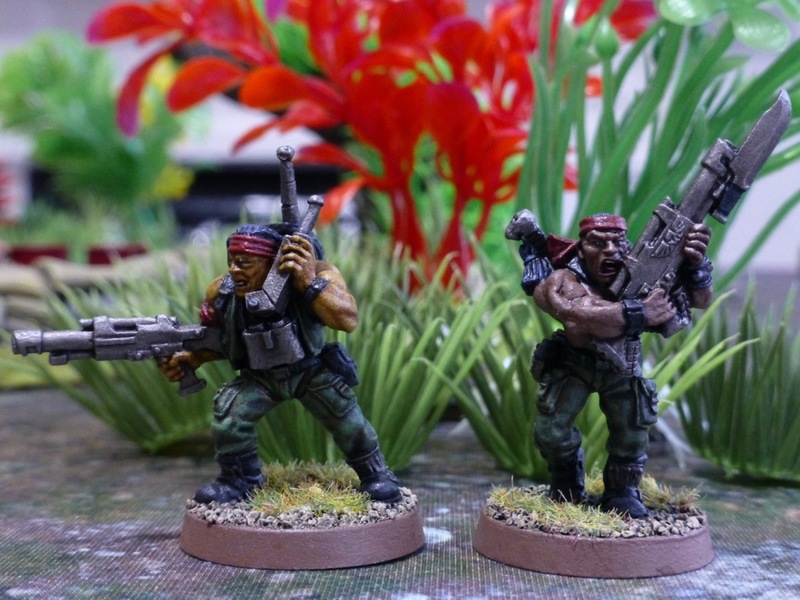 A second infantry squad and missile launcher team complete my platoon of Catachan Jungle Fighters for Warhammer 40k. 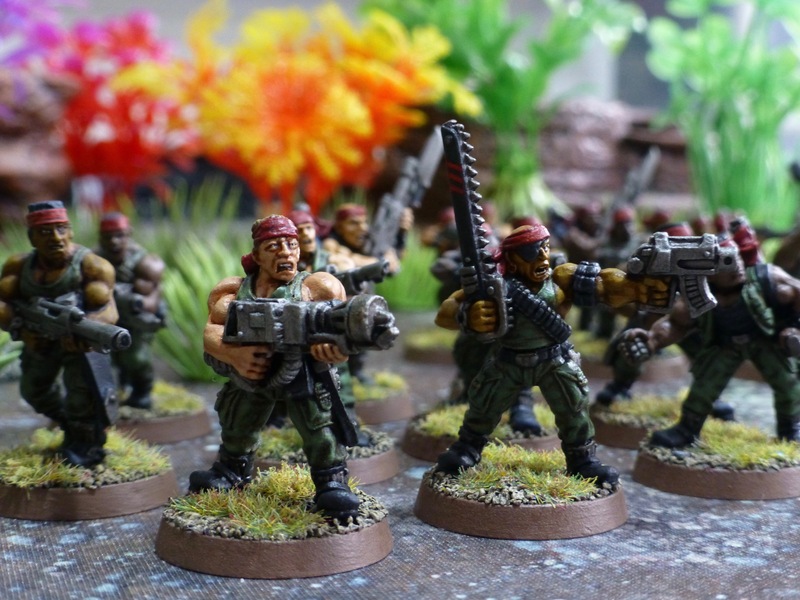 I am aiming for a detachment size force of 500 points at the moment, so there’s a fire support squad, a trio of Ogryns and the Captain still to come. 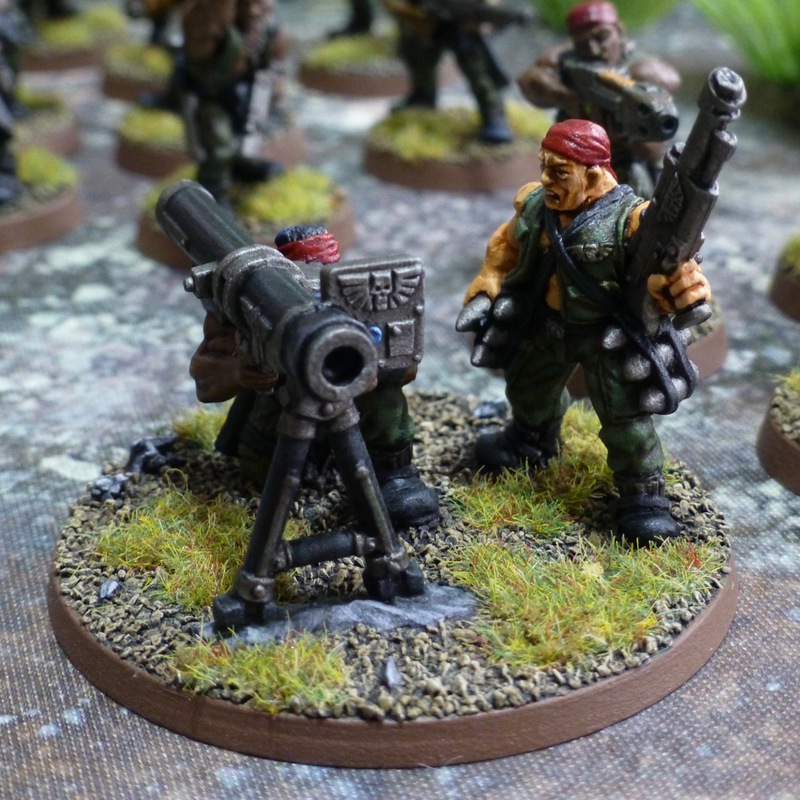 The missile launcher team features the metal sculpts but I used a new plastic tube as the original had been utilised for a different project. 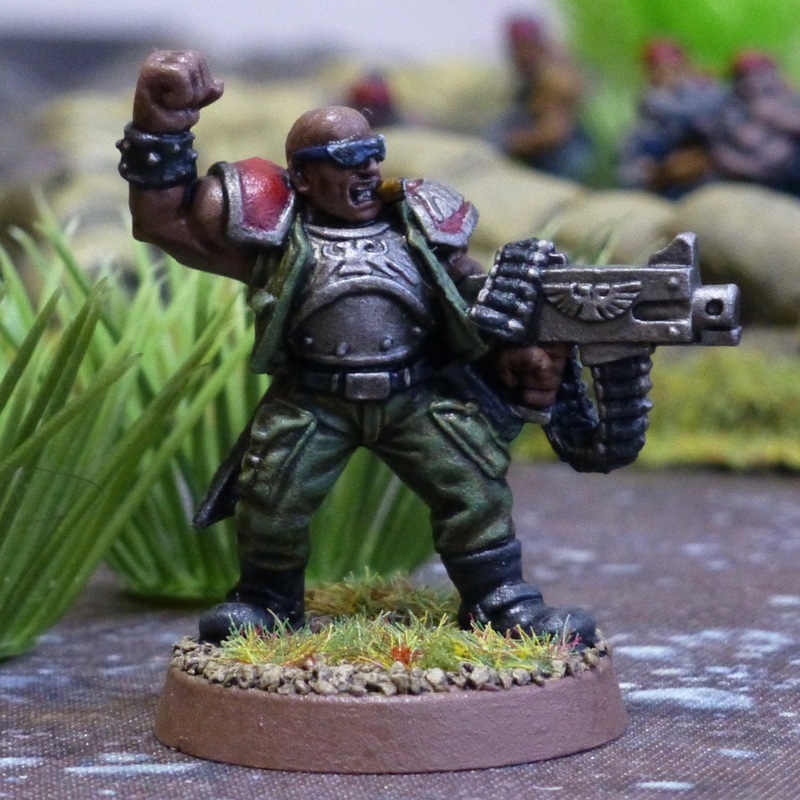 One of the squads also includes a plastic trooper that I put together from the command sprue as I was a metal figure short. His head is smaller than the others but otherwise he fits in reasonably well. 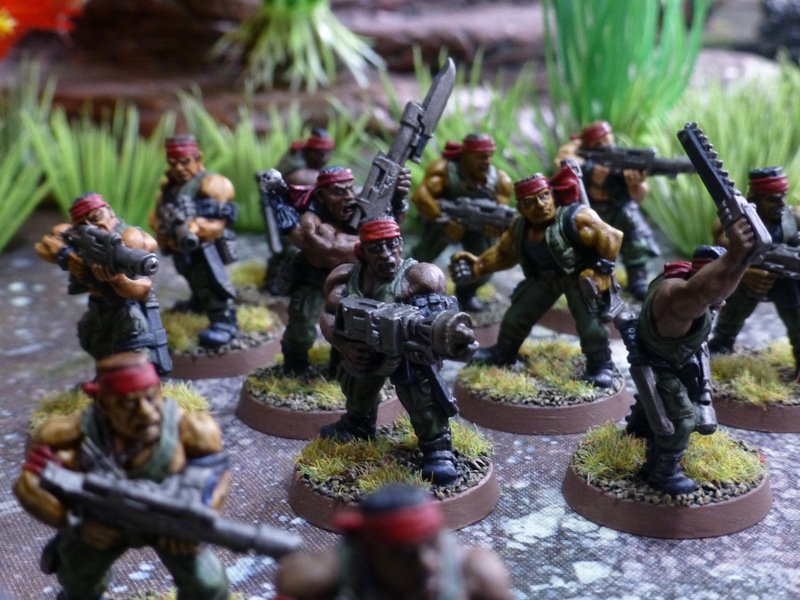 The plan for my Catachan Jungle Fighters is to have a 500 points force under Warhammer 40k 7th Edition rules. 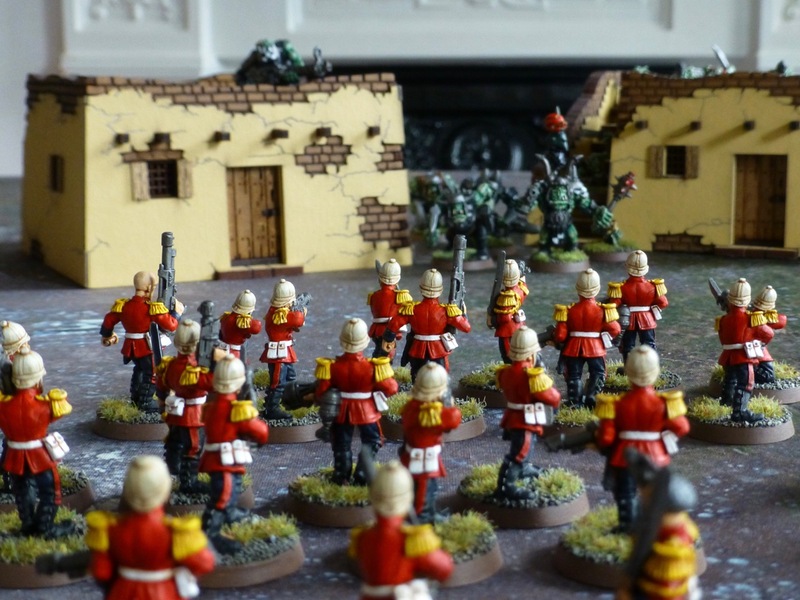 This will be formed around a single infantry platoon, reinforced by a squad of Ogryns and some fire support. 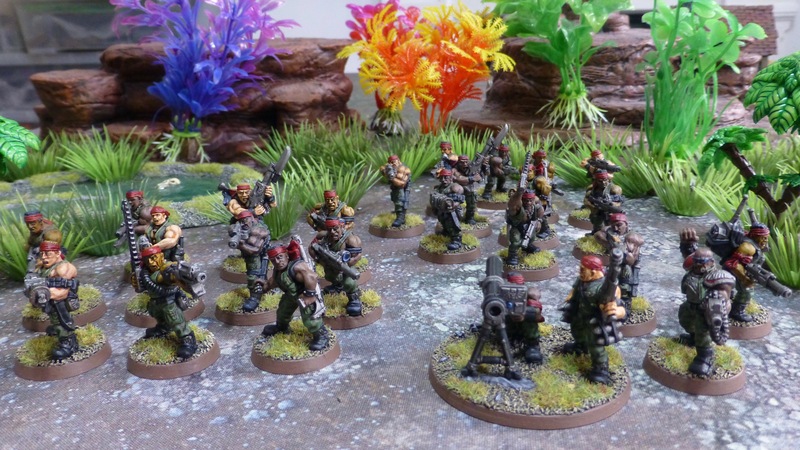 The first unit of infantry I already painted back in 2015, so now it is time to add the platoon command squad. 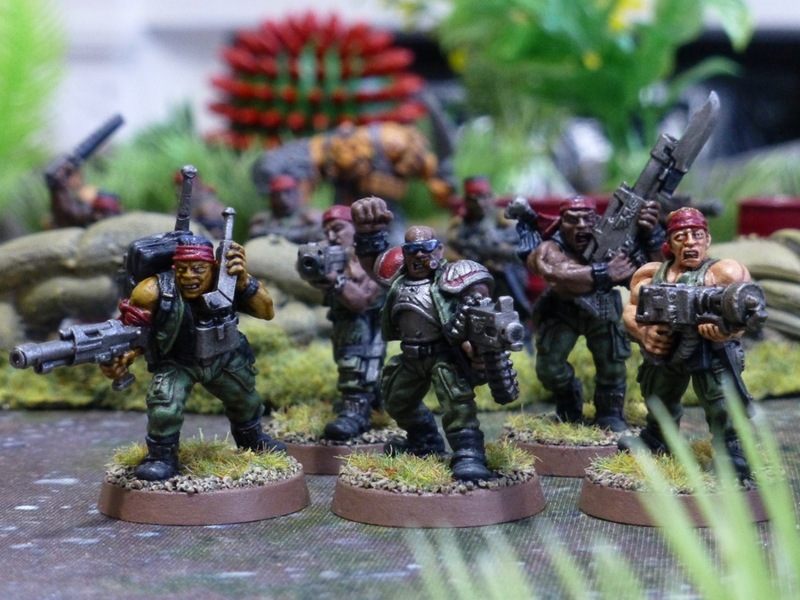 It’s made up of the original metal sculpts, including a lieutenant, two special weapon troopers and a soldier with voxcaster. Sunglasses – check. Cigar – check. Badass confirmed. 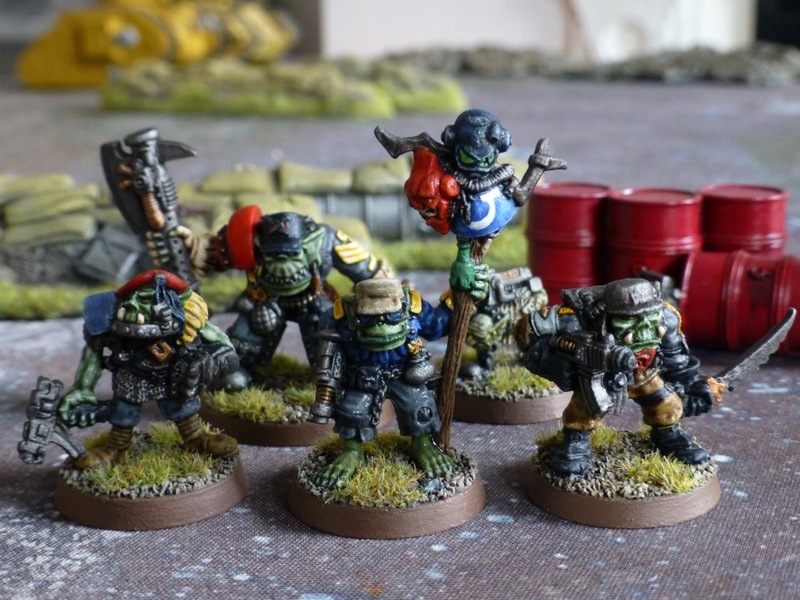 Still working on my Warhammer 40k Rogue Trader era Blood Axes warband, though Orktober wasn’t enough to finish the retinue of Nobz to accompany the Warboss. The latest addition are two more Bosses, with one carrying a trophy pole. 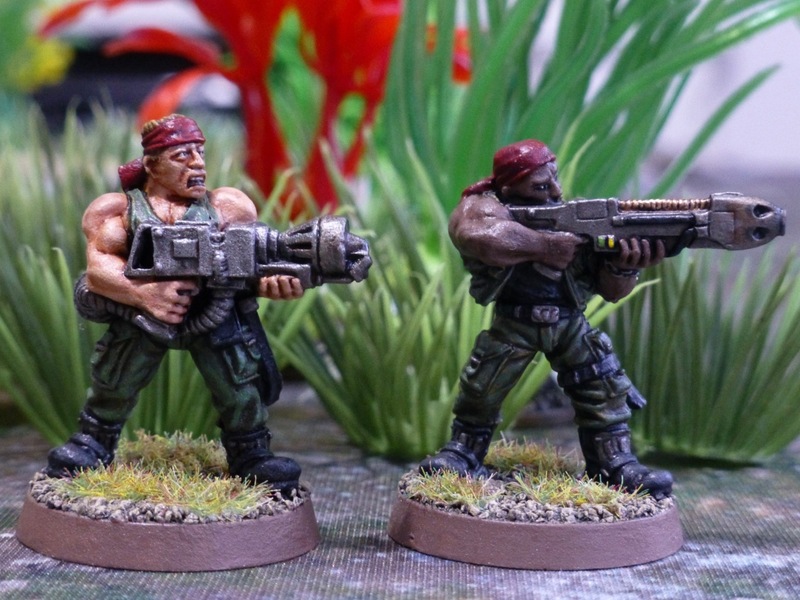 The infantry platoon for my Warhammer 40k Praetorian Guard is finally complete. 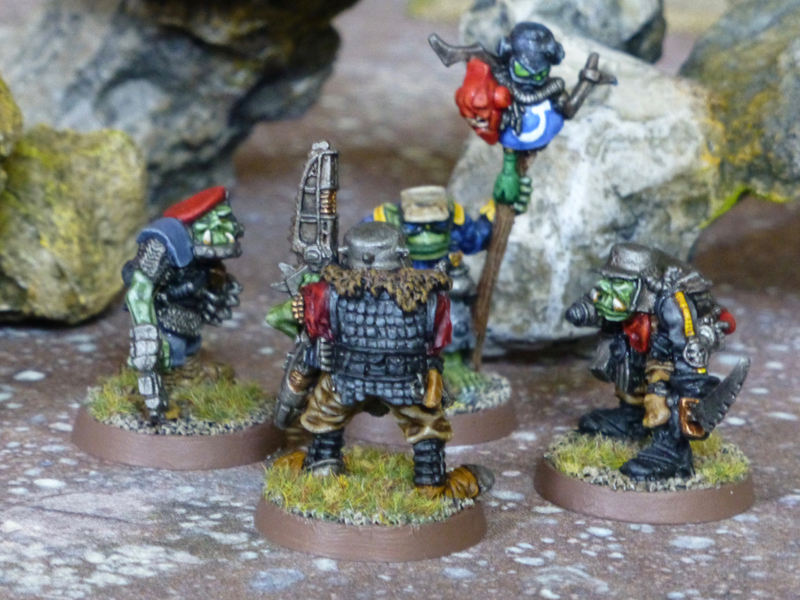 With the base colours already in place, I managed to stay focused just long enough on the production line. 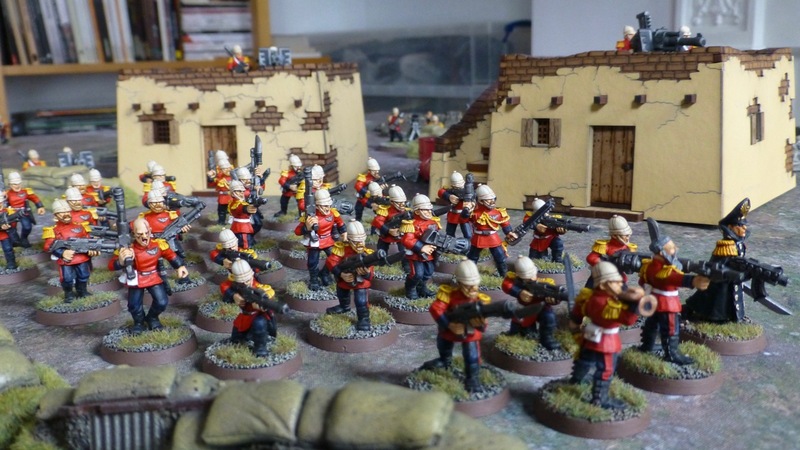 While I don’t want to paint another pith helmet in a while, I might put together and base coat a second platoon while I’m at it, so I have them ready for the next push. 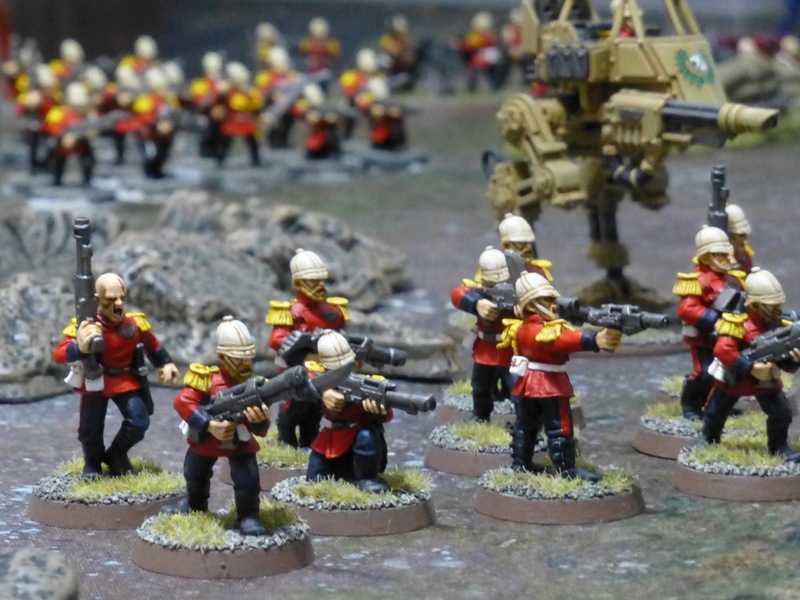 Praetoria is a hive world yet their regiments are often associated with actions on more rustic planets. Enter the adobe buildings from 4Ground once again, and some improvised barricades which I believe are from Ziterdes. 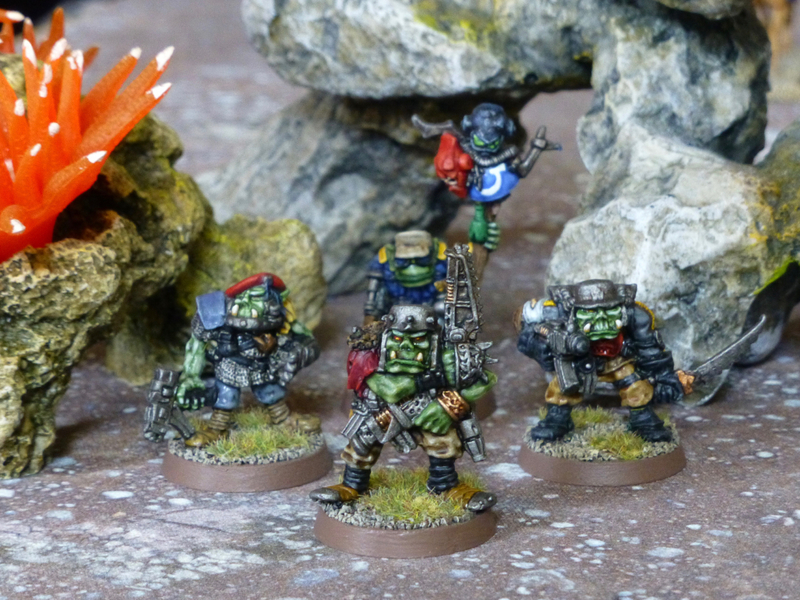 Now having an Ork army to field against them would be nice. 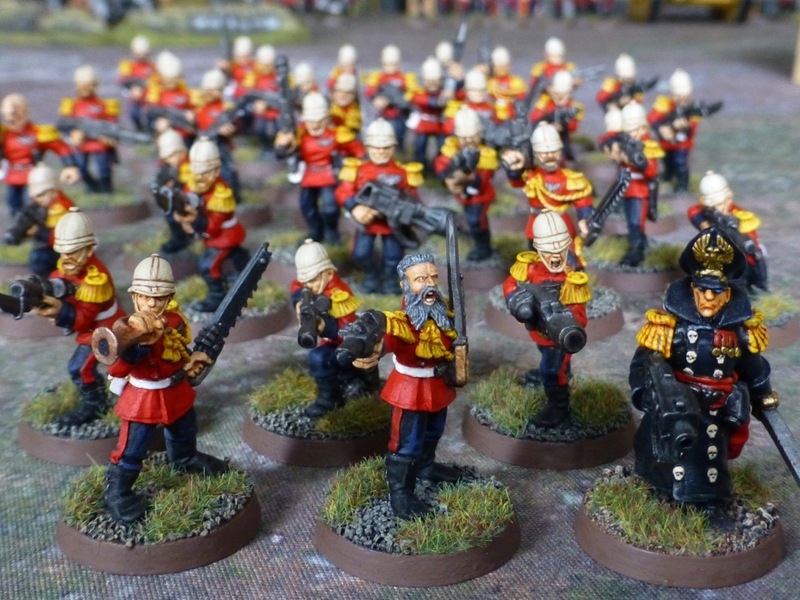 Unfortunately, only 11 out of 69 models for that army are painted so far – a project for another year. 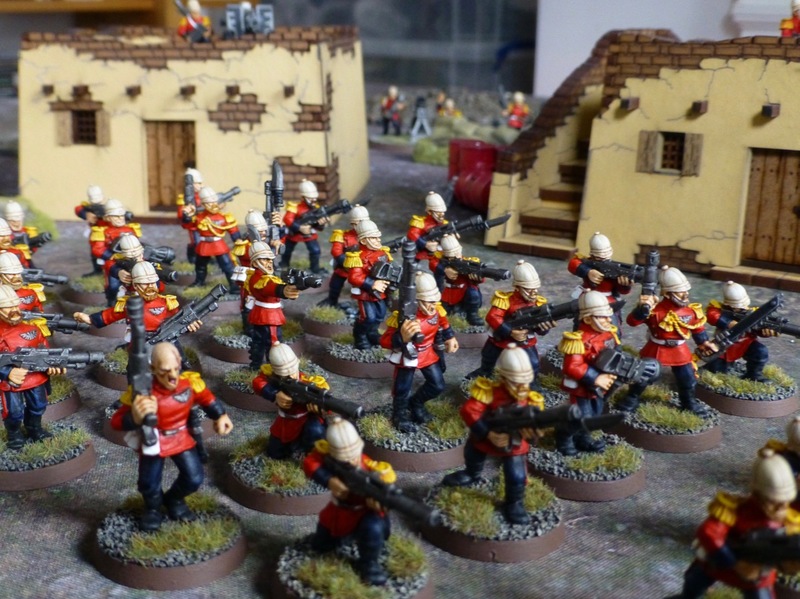 I’m progressing with my Praetorian Guard for Warhammer 40k and finished the first of three infantry squads in the platoon. There are only so many different sculpts, so this is going to be a bit repetitive. 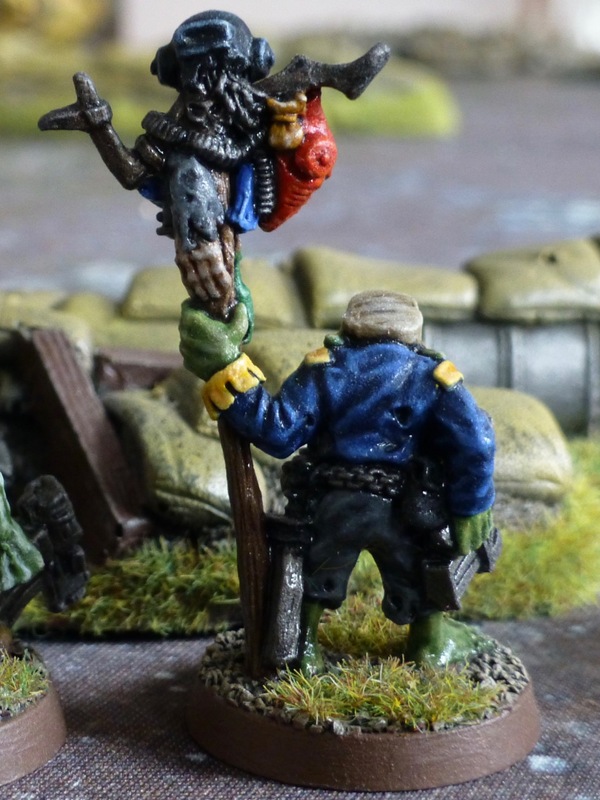 There actually is a conversion amongst these ten though, where I used a head from the Empire Flagellants, turning a Mordian into a Praetorian sans pith helmet. As I mentioned, I have a little battle scene set up, with the Necrons advancing on the Praetorian line. Here’s a shot from behind the gun line, showing the latest reinforcements throwing themselves against their pitiless enemy.